The Texas Blueberry Festival kicks off Friday, June 10, 2016 with the FREE Blueberry Bluegrass Concert in the Park, from 6 to 10 p.m. June 10 at Festival Plaza in downtown Nacogdoches. Rex Perry Autoplex is sponsoring the family-friendly event that will feature four musical acts: The Baker Family, The Coleman Brothers and the Lone Star Boys, The Bottom Dollar String Band, and Catahoula Drive. "With our first Friday night concert last year, the idea was to create a free event that would attract more people to spend the whole weekend here," said Scott Waller, Blueberry Bluegrass Concert in the Park committee member. "We knew there was a huge following in East Texas for Bluegrass, and we were very pleased with the turnout. We&apos;re excited about the lineup we have this year, and especially about moving the event to Festival Plaza." The concert starts at 6 p.m. and features The Baker Family, an award-winning band from Birch Tree, Missouri; The Coleman Brothers and the Lone Star Boys, featuring brothers Craig and Corey Coleman from Troup; The Bottom Dollar String Band, a progressive Bluegrass band from Austin; and Catahoula Drive, a traditional Bluegrass and Gospel band from Pineville, Louisiana. THE ACTS From south central Missouri, The Baker Family performs Bluegrass, Gospel and Classic Country at events and competitions throughout the country. They won the 2014 Oklahoma State Band championship and in 2013 placed first in the Pickin’ in the Pines Bluegrass contest in Flagstaff, Ariz. The acclaimed family band includes 17-year-old Trustin on fiddle, banjo, and vocals. He has earned several accolades, including the 2015 Tennessee State Grand Champion Fiddler, the 2015 Grand Lakes Grand Champion, the 2014 Oklahoma Junior State Fiddle Champion, the 2013 Junior National Grand Master Fiddler, the 2013 Texas Freshman State Champion, the 2011-14 Missouri Junior Champion and the 2011-12 Arkansas Junior State Fiddle Champion. Carina, 14, who plays mandolin, sings and jig dances, was a 2014 nominee for the Society for the Preservation of Bluegrass Music for America’s female vocalist of the year. Elijah, 12, plays upright bass and sings, and their mother, Carrie, plays guitar and sings. The Coleman Brothers and the Lone Star Boys include Craig Coleman on mandolin and Corey Coleman on fiddle and guitar, with both brothers bringing vocals to the mix. Throughout the years the Coleman Brothers have kept their vow to play traditional, hard-driving Bluegrass music. Harmonies and traditional instrumentation make for a hard-driving, highly energetic traditional Bluegrass band in the style of Bill Monroe and the Stanley Brothers. These Bluegrass disciples have shared the stage with the likes of Alison Krauss, the Dixie Chicks, Dr. Ralph Stanley, David Davis and the Warrior River Boys and many others. The Bottom Dollar String Band has been a growing Bluegrass powerhouse in Austin since their formation in the Texas Hill Country in 2011. Founding members are Hunter Hollingsworth (mandolin/lead vocals) and Josh Moore (banjo/vocals), with Devon Canady (guitar/vocals) joining a year later. They explore a sound that borrows from Bluegrass and blends it with genre-bending medleys, sing-along pop covers, and their original songs. They are preparing material for a new album release this year. Catahoula Drive, a Pineville, La. four-piece band, is looking to the future of Bluegrass music while keeping true to tradition, and was a finalist in the 2014 Society for the Preservation of Bluegrass Music of American Band Contest. Band members are Jamey Alwell, (guitar and vocals), brothers Greg Stewart (banjo and vocals) and Dennis Stewart (mandolin and vocals), and Tres Nugent (string bass and vocals). The concert will also feature food vendors, including some local farmer&apos;s market favorites selling homemade items, as well as catfish, barbecue, snowcones, Blueberry lemonade and lots of water. Organizers encourage attendees to bring blankets and lawn chairs. The event is family-friendly, so no coolers or alcohol will be allowed. Parking will be available downtown. 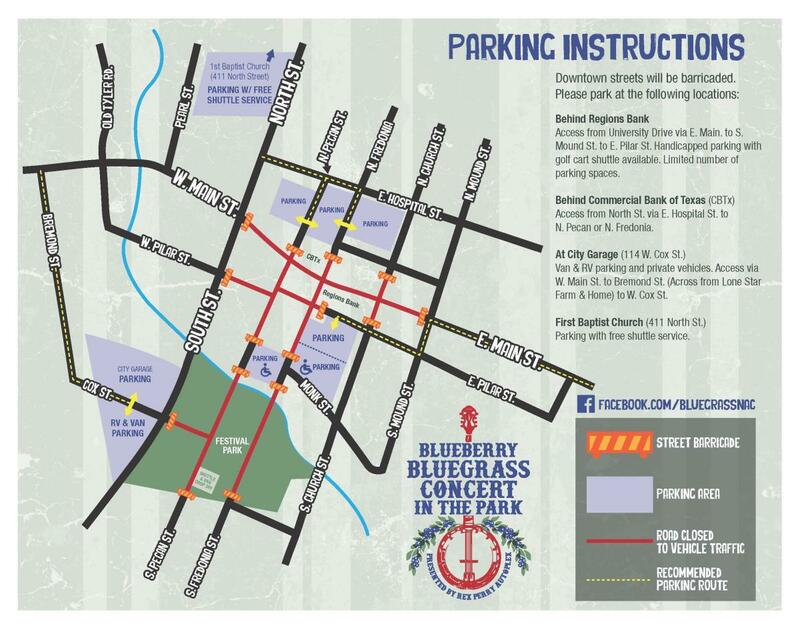 However, some downtown streets will be closed due to the Blueberry Festival, so concert-goers are urged to visit www.Facebook.com/bluegrassnac or TexasBlueberryFestival.com for parking instructions. Parking with free shuttle service to the concert venue will be available at First Baptist Church, 411 North St. Handicapped parking will be available behind Regions Bank, accessed via S. Mound St. to E. Pilar St. Van and RV parking will be at the Nacogdoches City Garage location at 114 W. Cox St.
Organizers are grateful for the enthusiastic partners that make the concert possible, especially Rex Perry Autoplex and the City of Nacogdoches. The Texas Blueberry Festival presented by Tipton Ford continues Saturday with a full day of activities in downtown Nacogdoches, including a Blueberry pancake breakfast, competitions and more live entertainment. For more information, visit TexasBlueberryFestival.com or call 936-560-5533.